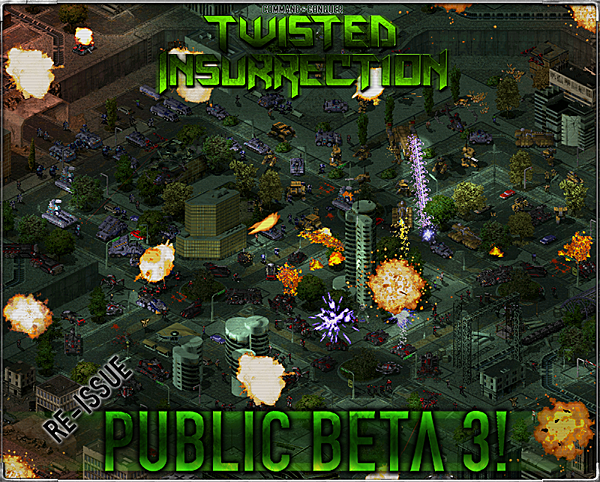 Twisted Insurrection Public Beta 3 Re-Issue Released!, . :: A new total of 431 changes since Public Beta 2! ::. Due-to the extraordinary progression on the staff patches and builds of Twisted Insurrection, there has been over 190 changes and additions to Twisted Insurrection: Public Beta 3 which featured 239 Changes and additions since Public Beta 2. With this in mind, we are more than pleased to announce Twisted Insurrection: Public Beta 3 Re-Issue! The Public Beta 3 Re-Issue features major game-play and balance changes along with fixing several bugs in the original Public Beta 3 release (including a fix for the Final TI Map Editor), there are also new multiplayer maps, campaign/challenge missions, several updates and changes to the campaign as a whole, revamped AI, units available and several performance enhancers to specific maps and the mod in general which results in less lag! For a full view of the changelog and all of the new additions and features, visit the download topic. The year is now 2019. The Tiberian World now stands with a very uncertain fate. The two most powerful and influential forces on the planet are trapped in a never ending dead lock of war and combat. Whilst the Global Defense Initiative has suffered many blows and military defeats, the faction itself still stands strong and has shown the world its amazing ability to endure harsh punishments and has recovered much lost ground. The Brotherhood of Nod has struggled and triumphed over its enemies, only for its victory to be short lived by the death of Kane the Messiah, causing an ever lasting deterioration through the Brotherhood and leading to defeats and chaos amongst the large faction. With the end of the First Tiberian War comes the dawn and age of a new, second Tiberian War, with new terrifying possibilities and potential. The fate of Earth lies dangerously unknown. Welcome to the Twisted Insurrection commander. Read the full Twisted Insurrection Story here. Download Twisted Insurrection: Public Beta 3 Re-Issue Here! Players should read the instructions on how to install to avoid any issues, as well as the known bugs and issues thread to prevent any confusions and false bug reporting. 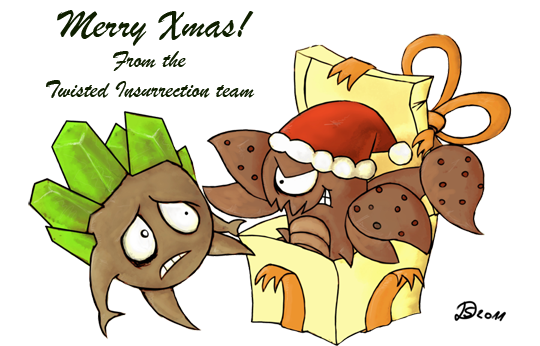 The Twisted Insurrection team would like all bug reports to be filed in this forum in order to keep the forum organization. On the 27th and 28th of December, several C&C players will be playing their favorite C&C games online to help boost CNCNet publicity, these games also include Twisted Insurrection. For a chance to play online against other Twisted Insurrection staff and fans, join in the fun on the 27th and 28th by running CNCNet.exe and clicking NETWORK on the TI Main Menu! Note that you can play online at any time with ease provided there are other TI Staff/players online and available. For more information on Twisted Insurrection, check out our pages around the web!